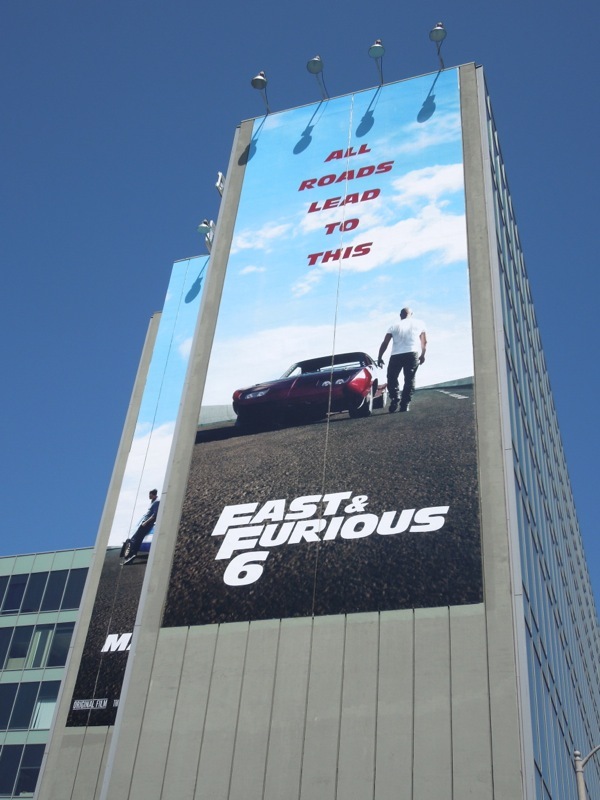 Fast & Furious 6 eh, how time flies when you're having fun (or driving a very fast car). 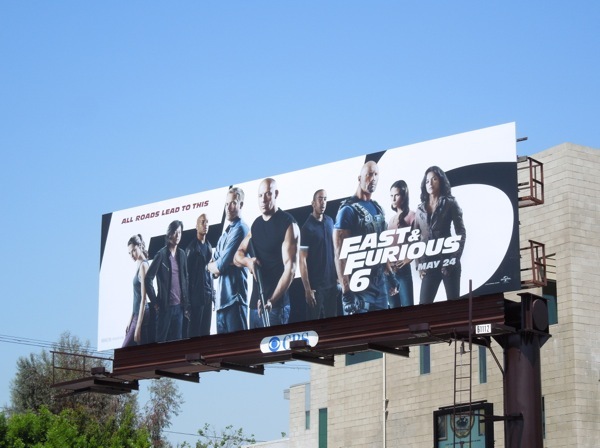 There's not many film franchises that can boast six installments, or that their box office has increased as the thrills have become even more over-the-top in these high-octane action movies. 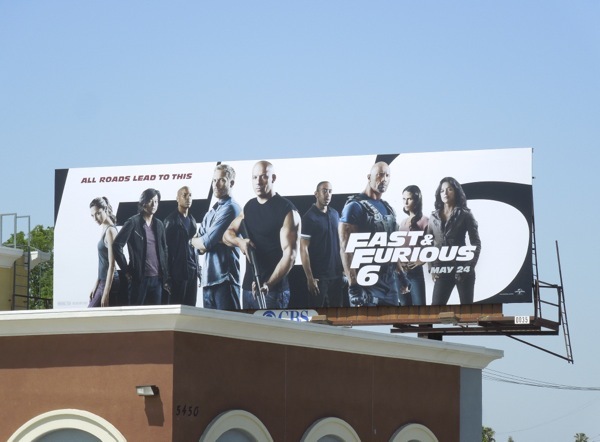 The mythology and cast have grown since the first illegal street racing undercover cop premise, but apparently all roads have led to this sixth movie. 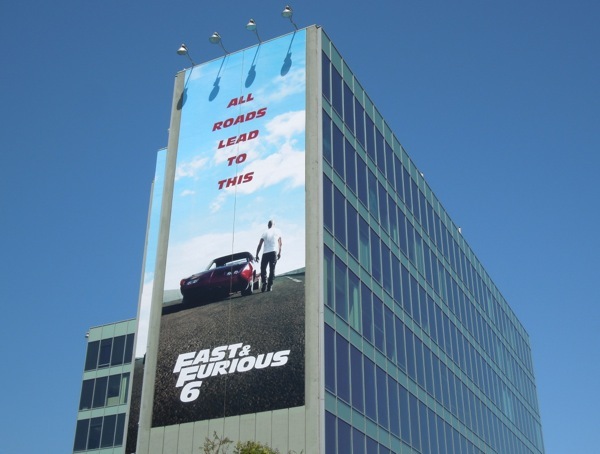 The introduction of Dwayne 'The Rock' Johnson in Fast 5 certainly gave the franchise an extra turbo boost and it's funny to see billboards for two of his movies at the same time, especially after he recently took over the reins of the big screen G.I. 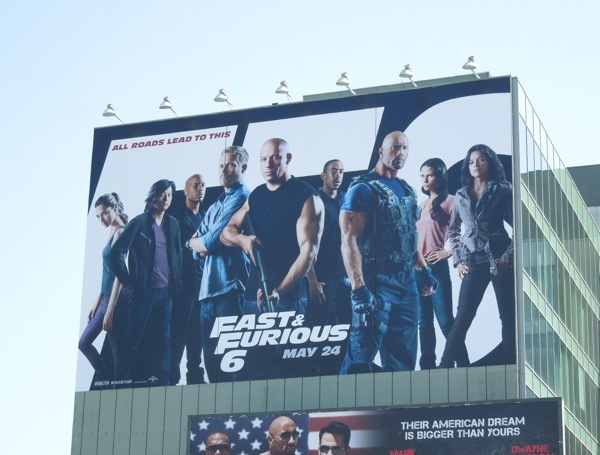 Joe franchise too. 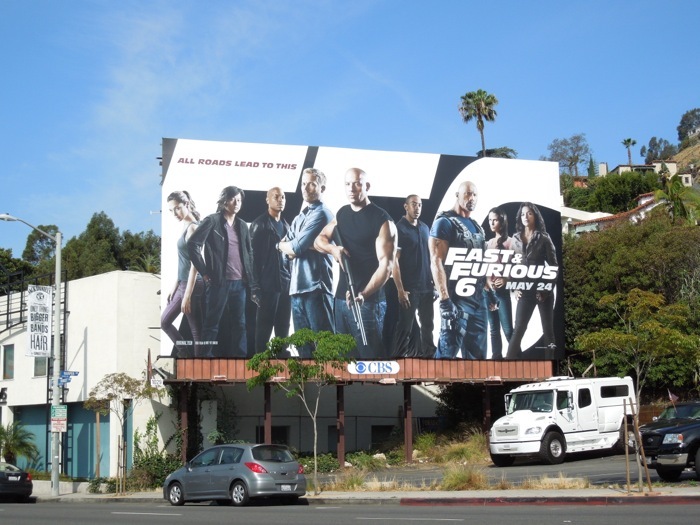 These giant-sized billboards also featuring original stars Vin Diesel, Paul Walker, Jordanna Brewster and Michelle Rodriguez were snapped at the busy intersection of Highland and Franklin Avenues on April 25, whilst the standard landscape billboard was spied along Pico Boulevard on April 27, 2013. 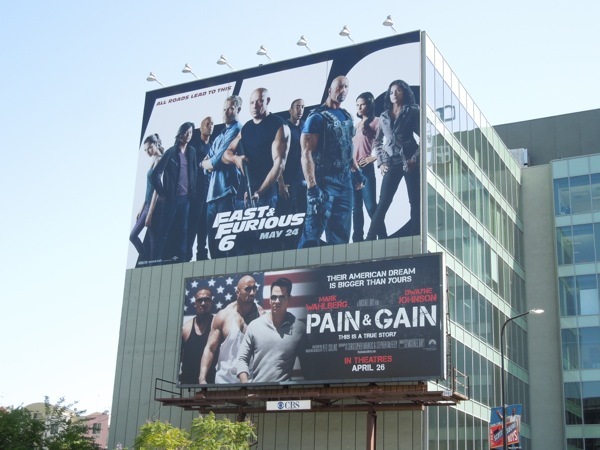 If you're a fan of the movies, be sure to check out these cool billboards for Fast Five around L.A., plus enjoy these original cars and costumes from the Fast & Furious movies on display at Universal Studios Hollywood over the years. 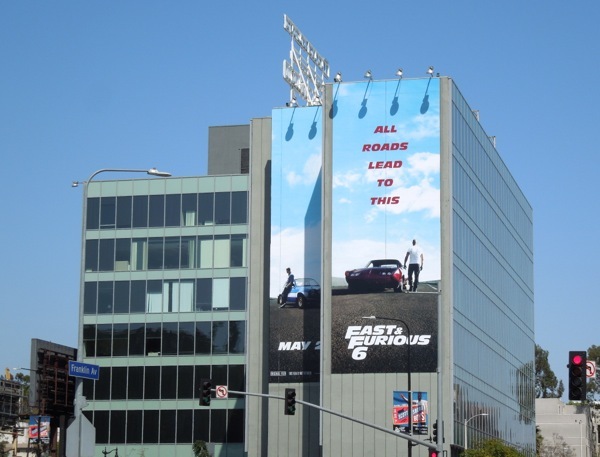 And don't despair, it sounds like this isn't the end of the road for this crew, as rumours are that Fast Seven will be hot on the heels of this sixth film (but who will survive to drive another day is anyone's guess). 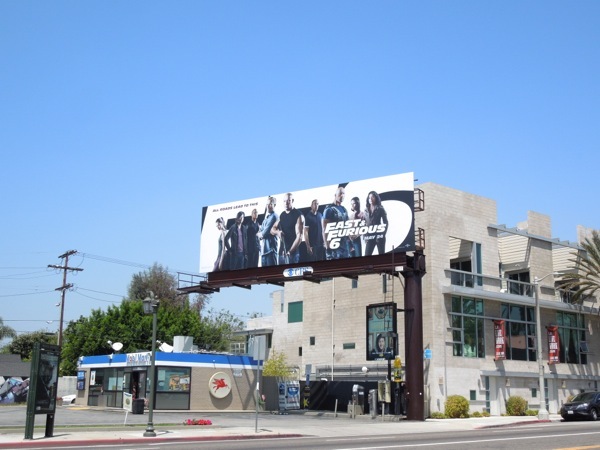 UPDATED: Here's another large billboard for the movie snapped along Sunset Boulevard on May 8, 2013.